For all the sound and noise about India’s prowess as a software giant, a depressingly small number of Indians are online. A recent presentation by Internet analysts Mary Meeker and Liang Wu of venture capital firm Kleiner Perkins shows that a mere 137 million people in India are Internet users. This works out to a distressingly low population penetration of just 11%. 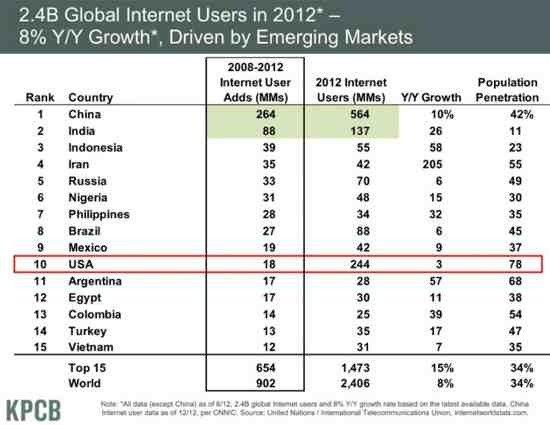 Even if the numbers are a bit off the mark, Internet penetration in India is still abysmal. 1. Economic growth in India has not lifted all boats. Only a small sliver of the urban residents have benefited from the liberalization measures set in motion in the 1990s. The vast majority of Indians, particularly in the rural hinterland, continue to wage a bitter struggle for survival. People desperate for food, clothing and shelter are not going to be hungry to go online. 2. Successive Indian governments over the last 10 years have made little effort to bridge the digital divide. The best way to boost Internet penetration in the rural areas and for the urban poor is by way of subsidizing Internet access and low-cost computers. Unless India makes broadband Internet access a national priority, the vast majority of Indians will continue to be left far behind in the digital economy that today covers most aspects of life. Compared to India, China has made significant strides in providing Internet access to a wider swath of its people. An estimated 564 million (representing a population penetration of 42%) enjoy Internet access in China. It’s no coincidence that greater Internet access in China has also been accompanied by Chinese cyber-warfare tactics and intrusion across the world to steal intellectual property of other nations. Today China leads the world in online attacks. India cannot afford to tarry any longer. Broadening Internet access to its vast multitudes must become an urgent national priority.